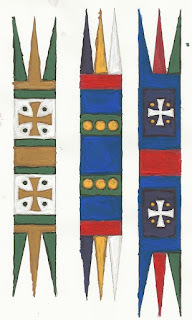 I have been playing about with hand painted banners for my Normans. All of my shields are hand painted as are the cast on banners for my cavalry. I made these as outlines on the PC (using open Office), printed them and then painted with Vallejo paints. I have cut them out, tidied up with paint and attached them to figures. I will take some pictures of the figures once the varnish has dried and I have them based up. Norman army is looking pretty good now. I bought 80 Crusader infantry at salute and these are just about painted. I will have 40 cavalry, 72 Foot and 24 skirmishers pretty soon, should be enough for Hail Caesar, WAB, Clash of Empires or whatever rule set I end up with. Hail Caesar looks pretty good. I now have a quorum of 6mm Austrians and Franco-Bavarians. I have been through all of my Adler figures and painted everything in sight. This came about because I played a couple of games with some lovely 18mm AB figures. Really inspired by this but daunted by the lead time and expense of doing 18mm. Then I remembered the mass of painted and unpainted Adlers that I have. Quite a few French, some Austrians and lots of unpainted; French cavalry, Austrians of all sorts and a Bavarian "brigade". So they are now painted and I am on my third solo game with Black Powder and have just ordered some more figures from Adler. My next post will cover my thoughts on using Black powder for solo games.